When a love of chewing meets powerful jaws, your adorable pit bull can be hard to shop for! We’ve researched and reviewed some of the best-selling durable dog toys that suit the pitbull breed. But before you chase down our reviews, check out these specs to consider when choosing new toys for your dog! Caution: Always supervise playtime with new toys, especially if your dog is a heavy chewer. Count - How many are you getting? Multi-pack toys offer a lot of value as well as variety if your dog isn’t picky. Size - Pit bulls are medium to large-sized dogs, so look for toys that are suited to medium and large dog breeds. 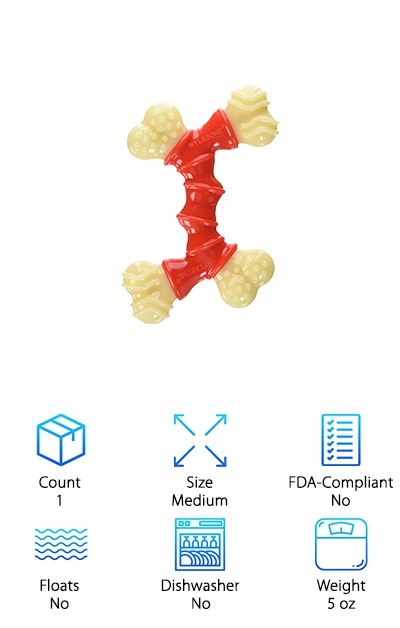 FDA-Compliant - Some dog toys are made from food-grade materials. Some pet owners prefer this for the high quality standards. Floats - Does your pitbull love to play in the water? Get them a toy that they can take with them on hot summer days! Dishwasher-Safe - This is especially important to consider with treat-dispensing toys and most rubber or hollow toys in general. Weight - Heavier toys may be able to stand up to chewing for longer periods of time or be easier to throw for fetching games. Now that you know what to look for, let’s check out some reviews! Our top pick and budget pick summarize our favorite options for dog toys for pit bulls. If you want to really compare and contrast, keep reading to view the other products that made it to our list. Go fetch! Rope toys are some of the best dog toys for pit bulls that love to play tug-of-war and chew. It’s no wonder that this value-pack of ten rope toys made it to the top of our indestructible dog toys for pit bulls review! Made from 100% natural cotton, these braided rope toys are durable and washable. They also provide dental benefits by helping to fight plaque build-up and stimulating the gums during chewing. Rope toys are amazing multi-use toys for both solo play and interactive play with you or other dogs. For intense chewers, a rope toy can take longer to break down than typical rubber toys--saving you cleanup time and money! Play fetch and tug-of-war, then let your pup go off by himself to have a rewarding chewing session. Plus, you’re getting multiple toys for a great low price--what’s not to love? 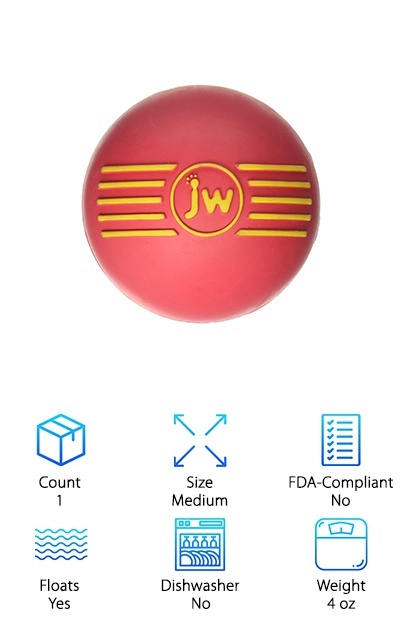 Try out the JW Pet iSqueak Ball if you’re looking for a durable rubber squeaky toy that floats! Available at a great low price, the iSqueak Ball in size medium is perfect for medium to large dogs with its 3.1’’ diameter. Made from dense but pliable natural rubber, this squeaky ball is fade-resistant and easy to wash. Choose from three assorted bright colors, and enjoy the vanilla extract flavor that can help freshen your pit bull’s doggy breath! Playing fetching and catching games are extra-fun when there’s a squeaky, bouncy ball involved. And when your dog is tired out from running back and forth, they can settle down and have a good gnaw on the ball while you put your feet up! 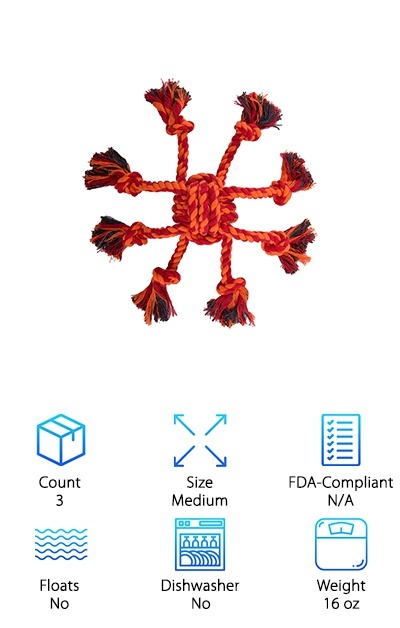 This dog toy offers a great combination of value and durability and appeals to a variety of dog personalities, preferences, and chewing abilities. Kong is known for their tough dog toys, and their Kong Jumbler Ball Toy is a great example of the durability they’re known for! The Large/XL size is 7.7’’ in diameter for larger pit bulls, while the Medium/Large size is 5.5’’ diameter for dogs on the slightly smaller size. An exterior of dense rubber stands up to gnawing and powerful jaws, while a tennis ball on the inside shakes around and squeaks for fun active play. Your pup will love chasing after it for games of fetch, and dogs that love squeakers can have tons of fun with it on their own! It also floats, so you can use it in the kiddy pool or at the lake to cool off on a hot day. It’s kind of like two toys in one, so if your dog chews through that outer layer, you’ve still got another toy for them to go through! Sometimes your dog needs to entertain himself while you’re busy or at work. That’s where the Nylabone Dura Chew Double Bone comes in. One of the best chew toys for pit bulls, the Double Bone is a long-lasting option for dogs that love to chew. The interesting shape and ridges help to stimulate the gums and control plaque and tartar buildup for better dental health. It’s also infused with a bacon flavor to make the toy even more interesting. Food-motivated pit bulls may appreciate that bacon flavor without all of the bacon calories involved! The Double Bone measures 6.2’’ from end to end with different textures on the four nubbed ends. When you need a break or when your dog just needs to chill out in their crate for a minute, this chew toy can help both of you get what you need! This eight-pack of a variety of dog toys from Otterly Pets can help to keep your pit bull occupied during the day. A mix of rope toys, plus a rubber ball and frisbee, provide tons of fun for interactive or solo playtime! The rope toys are washable if they get left outside or slobbered on, and they make great options for tug of war and fetch. This eight-pack is ideal for entertaining multiple dogs who all want their own toys, or for finding out what kinds of toy your puppy or new foster likes! Rope toys are durable enough for average to above-average chewers, plus they can help support good dental health. If your pitbull is young or on the smaller side, these toys are the perfect size. They may be the best option for intense chewers who are pretty much guaranteed to destroy toys--at the very least it will be less destructive on your wallet! If you’ve loved Nerf products since you were a kid, you’ll be happy to know that they make dog toys, too! The Nerf Dog Squeak Ball is one of the best indestructible dog toys for pit bulls, especially if they love squeakers and playing fetch! This dog toy also floats, so your water-loving pup can splash around without losing their beloved toy. The lightweight and durable ball has a 4.25’’ diameter ideal for medium to large dog breeds. It’s made from BPA-free and FDA-approved food-grade rubber that’s also water-resistant and weather-resistant. It works really well for outdoor play as a result. Play doggy soccer or send it bouncing away for hours of entertainment. The squeaker is deep enough in the ball that it’s hard for an avid chewer to reach. If your pitbull loves squeaking toys, the Nerf Dog Squeak Ball can give them that squeak sound they love with less mess to clean up on your end! The DoDoDo Dog Rope belongs on our list of indestructible dog toys for pit bulls thanks to its tough non-toxic design and fun play options! 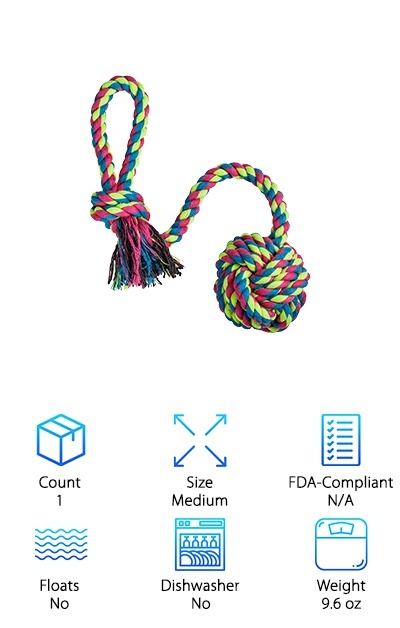 Made from reinforced cotton, this braided rope dog toy has a knotted handle on one end and a rope ball on the other. 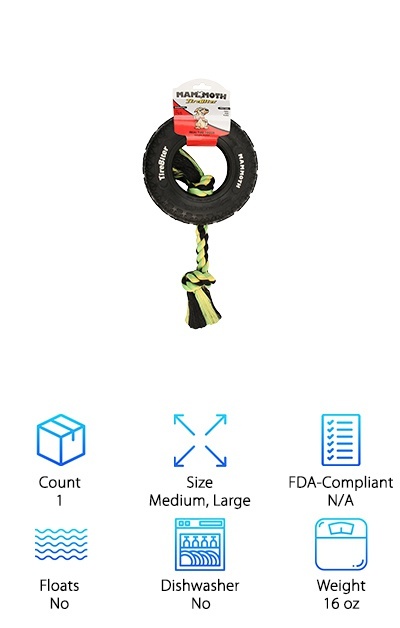 The toy measures 20.5’’ long from end to end, and the rope ball is 3.6’’ in diameter, large enough for medium to large-sized dogs like the pit bull! Your pup will love playing tug of war with this rope toy before settling down to gnaw on the ropes on his own, all tuckered out. If this rope dog toy gets too dirty or slobbery, you can just pop it into the washing machine to refresh it. This sturdy toy also helps your dog’s dental health when they chew it, stimulating their gums and helping to keep their teeth clean. The Mammoth TireBiter with Rope is a natural rubber tire with a two-ply nylon knotted rope braid tail. The medium size features an 8’’ tire diameter with 19’’ of overall length, while the large size has a 10’’ tire diameter and 27’’ overall length. The medium size should be a good fit for most pitbulls, although puppies may prefer the small size. This toy is a fun one for games of fetch and tug-of-war as well as entertaining your dog on its own. Heavy chewers may be able to gnaw down the rubber at a quick pace, but for most dogs it should hold up fine. For extra entertainment, smear some peanut butter or another sticky treat on the inside of the tire to keep your pup occupied for a while! This fun and durable toy is an obvious choice for our list of dog toys for pit bulls. Sometimes the best way to deal with a dog that’s really good at destroying toys is to just buy more toys! 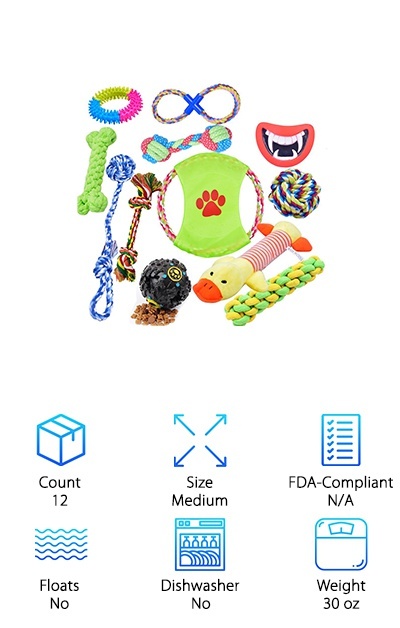 This value-pack of dog toys from Rio Direct provides twelve toys at a low price. These include multiple braided rope toys as well as a throwing disc, squeaky toy, and treat dispensing ball. Having many toys available can help slow down your pup’s path of destruction--switch out toys that are looking a little well-loved to give them a break! Rope toys are great for chewing, since they are gentle on the mouth while still giving the jaw a workout. You can play tug-of-war or fetch as well! This 12-pack is also great for finding out what toys a new puppy likes best or for entertaining multiple dogs. Or maybe your pup will want to have them all to himself--we can’t blame him! These tough dog rope chews from Expawlorer are a great way to play with your pit bull adult or puppy! The 100% cotton braided ropes are fun to chew while being gentle on your dog’s mouth. A plastic handle makes it easy for you to play fetch and tug-of-war and help burn off some of that pitbull energy! 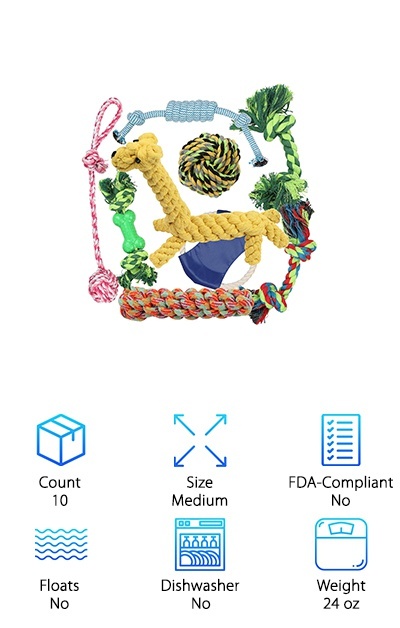 The toys measure 20’’ in total length, and you get three toys in this value pack of rope chews. 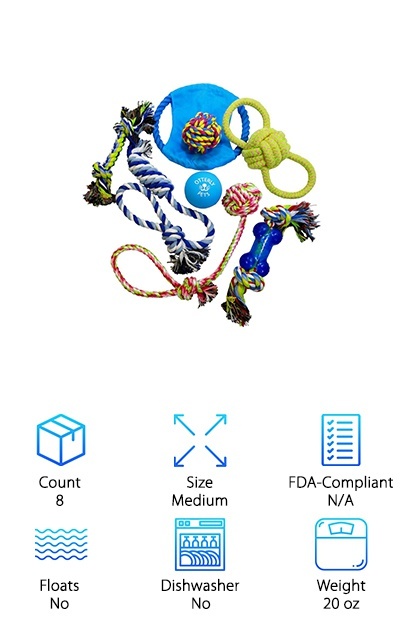 Expawlorer also offers a rope ball toy that your dog might love for solo playtime! Giving your dog plenty of things to do helps to burn off mental and physical energy and prevent unwanted behaviors like chewing on furniture. When you’re dealing with the powerful jaws of a pitbull, that’s especially important to keep your chair legs and couch cushions safe! This three-pack of rope toys provides a fun and basic tug of war chew toy that can help you and your pup bond!